Azure has a thriving ecosystem where partners can publish many different offer types including virtual machine images, SaaS, solution templates, and managed applications, allowing customers to solve their unique problems in the way which best fits their scenario. Azure customers can now discover and acquire secure and certified container images in Azure marketplace to build a container-based solution. All images available in Azure marketplace are certified and validated against container runtimes in Azure like managed Azure Kubernetes Service (AKS) allowing customers to build with confidence and deploy with flexibility. For ISVs who have their applications offered in container-based images, this new offer type offers the opportunity to publish their solutions and reach Azure users who are building container-based architecture. This helps ISVs to publish with confidence through Azure Certified program and validation across industry-standard container formats and across the different Azure container services. Container images can be discovered in Azure Marketplace, as well as Azure portal under the ‘Container apps’ section. Here, you can browse the range of container images available and once you select one you can view the details of the container image and subscribe to it. This copies the image to an instance of the Azure Container Registry, either new or an existing one, within your Azure subscription. Once the image is available in your Azure Container Registry, it can be used like any other container image. 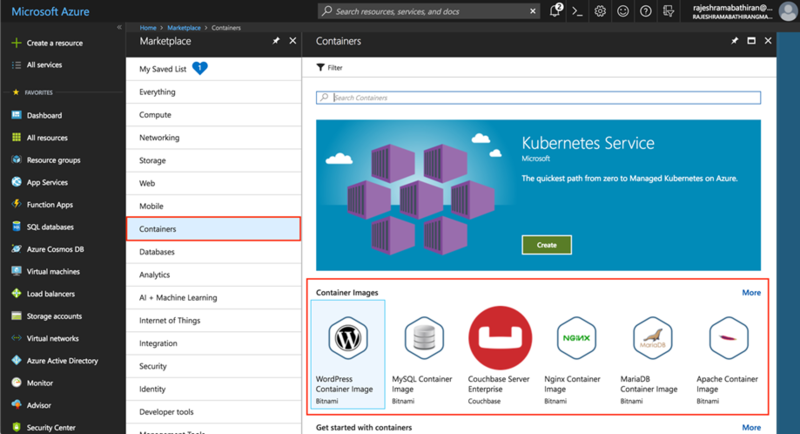 For example, you can launch an instance of the container in Azure Container Instance, or you can build your custom image based on the image from Azure marketplace and integrate it in your CI/CD pipeline. You can also opt in for auto updates. Enrolling for auto update will push newer versions of the container image to your Azure Container Registry as and when they are published by the image publisher. We have partnered with Bitnami and Couchbase for this initial launch partners. There is also an entire list of container images in Azure marketplace. All images at the time of launch are available for free, or BYOL (Bring Your Own License). If you are an Azure partner and are interested in helping us shape the container partner ecosystem, start by onboarding to Marketplace as a Publisher.